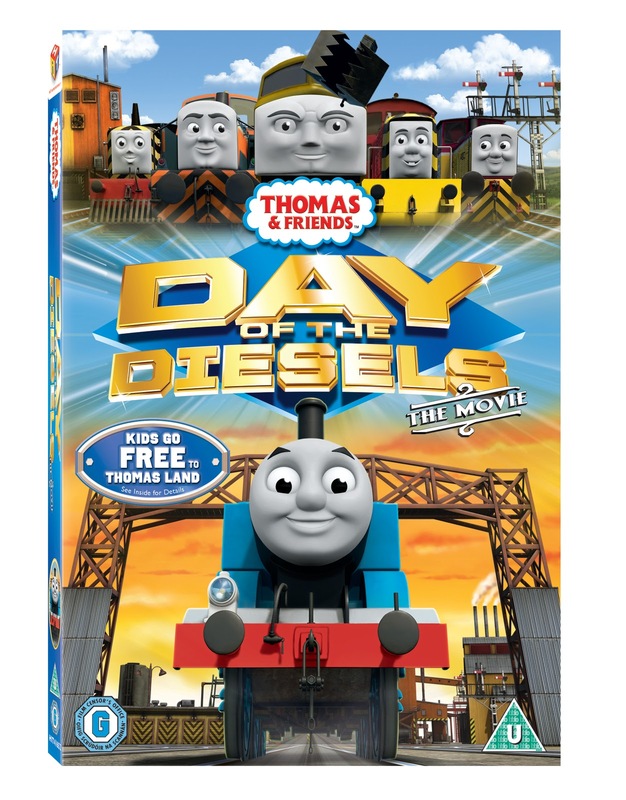 We were very excited to be sent a copy of Thomas and Friends Day of the Diesels new dvd to review, Blake loves Thomas, he calls all trains Thomas and his Brewster from Chuggington and Toystory duplo train are both also called Thomas and are best friends in the world of Blake! Blake likes to watch a few of the really old episodes which I watched as a child when he feels sleepy and he likes the new episodes at playtime - he likes to reenact what he's watching and usually he's Thomas, but sometimes Percy. We popped the DVD on - it's an hour long special and I know Blake wont sit through the whole thing. he's 27 months so we tend to watch long cartoon in 15 min bursts and talk about what we've seen and go back to it later. We loved watching the trains whizz around Sodor and watching Belle and Flynn the new steamies playing games with Thomas, a lot of the focus on this dvd is around Percy - he feels a little left out with the new trains taking away Thomas' attention and he soon finds a new friendship with the Diesels, including Diesel 10 who has a big claw on his head, and two newbies - Dash and Dart who make a comedy pair - who are devious, and I think for a two year old, some of this story line was a little to devious for him to understand what was happening but he seemed happy enough to watch the trains - although he definitely picked up that something wrong was happening by the music and tone of those parts of the story, we always talk about what we are watching and I found it quite hard to think of a way to explain this bit. Of course there were more fire scenes as both Flynn and Belle are fire fighting trains and the other scenes didn't seem to be as frightening as the opening scene and I think Blake really liked Flynn - he keeps pretending to squirt water - or really doing it at bath time! It's a good dvd and a lovely story as everyone is always friends and work together in the end. There are some great toys that go with this story and we've added one of the Thomas take and play sets to the Christmas list! 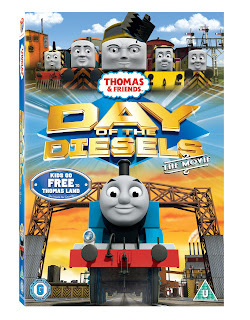 There are new pages for Day of the Diesels on the Thomas and Friends website with activity sheet downloads and other extras. I have two dvd copies to giveaway to my readers, UK only please, these will be sent out directly from the lovely PR lady. All you have to do to enter is name one of the new four characters in the comments box below. For bonus chances you can tweet a link to this post (@beachpebble) or like my blog's facebook page and let me know in a separate comment below. Competition closes at 8pm on Friday 30th September 2011. The winners are Volker and Jenna - Congratulations! Choo Choo! We love a bit of Thomas in our house!